This is a Hand Signed White Card 5.5" x 3.5" by the two late Characters who both appeared in Emmerdale Farm as the two Pub Landlords Amos and Henry. 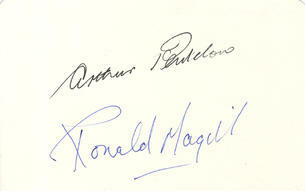 Arthur Pentelow died in 1991 and Ronald Magill in 2007. Arthur Pentelow (14 February 1924 - 6 August 1991) was an English actor who was best known for playing Henry Wilks in Emmerdale Farm from 1972-91. Pentelow also played George Greenwood in Coronation Street from 1968-71. Ronald Edmund Magill (21 April 1920 - 6 September 2007) was an English actor. He is best remembered for playing Amos Brearly in the British soap opera Emmerdale Farm from 1972 to 1991, and appeared again in this role in 1994 and 1995.